January can be cruel. The days are short and cold, and the contrast between the overindulgence of the holiday season and January’s asceticism always feels, to me, like a shock to the system. Instead of subjecting ourselves solely to salads in an effort to keep unrealistic resolutions, let’s use January instead as an opportunity, a chance to slow down, take care, and feed ourselves things that are nourishing and satisfying. 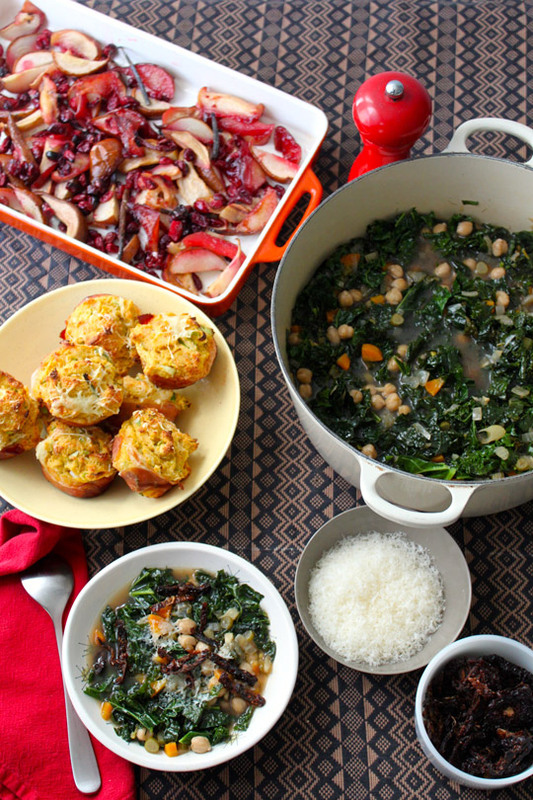 Dishes like this simple soup that combines nutritional powerhouses legumes and leafy greens. Topped with meaty sun-dried tomatoes, a drizzle of good olive oil and a shower of cheese, it is resolutely healthy and deeply warming. Serve it with savory muffins—nutty from corn flour and rich from a little cured ham and cheese. For dessert, roasted fruit, flecked with vanilla, as good with whipped cream as without. Active time: 1 hour, including vegetable prep. Serves 4. In a large pot, heat 1/4 cup olive oil over medium high heat until shimmering. Add carrot, onion, fennel and a hearty pinch of both salt and black pepper. Cook vegetables, stirring periodically, until just beginning to brown and onion appears translucent, about 10 minutes. Add garlic and chili flakes and stir to combine. Add stock and bring mixture to a boil. Reduce heat to a simmer and add chickpeas and kale, stirring to combine. Simmer 5 minutes more until kale is wilted and bright green. Taste and adjust salt and pepper as necessary. To serve, ladle into bowls and top each with a sprinkle of grated pecorino, a few ribbons of sundered tomato, and a drizzle of olive oil. Active time: 20 minutes, total time: 45 minutes. Heat oven to 375ºF and line each cup of a 12-cup muffin tin with thinly sliced prosciutto, draping some over top of each cup. Combine corn flour, all-purpose flour, baking powder, baking soda, chili powder, cayenne and salt in a large bowl, and whisk well. In another bowl, beat eggs lightly. Add buttermilk, maple syrup, and melted butter, and whisk to combine. Stir wet ingredients into dry until just combined and fold in leeks and cheese, reserving 1/4 cup. Divide batter into ham-lined muffin cups and top each with a pinch of remaining cheese. Bake 25 to 30 minutes, until a toothpick inserted into the center of a muffin comes out clean. Allow to cool completely in muffin tin. Use an offset spatula or a butter knife to remove. Active time: 50 minutes. Serves 4. Take vanilla beans and, using the back of a knife, scrape out seeds. In a small bowl, combine vanilla seeds, pods and sugar. Rub together until vanilla seeds are evenly distributed throughout sugar. In a large bowl, combine apples, cranberries, and pears. Sprinkle vanilla sugar and salt over top, and toss well to combine. Pour fruit into a single layer on a sheet pan and roast, uncovered. After 10 to 15 minutes, the fruit will release liquid. Continue to roast until liquid has evaporated and caramelized, about 30 minutes altogether. Allow to cool to room temperature and serve as-is, or spooned over unsweetened whipped cream.